We’ve improved the performance and usability of the SyncView: it is now able to exclude branches making the sync process much faster. As you know, the SyncView is the view in the GUI that you can use to preview what needs to be replicated between different servers and then run the replicas. We have added “excluded branches”: branches that you don’t want to sync between your repo and the remote one. In my case I run a Plastic server on my laptop (using a SQLite backend handling about 18Gb) but I don’t have full replicas of the central repositories. 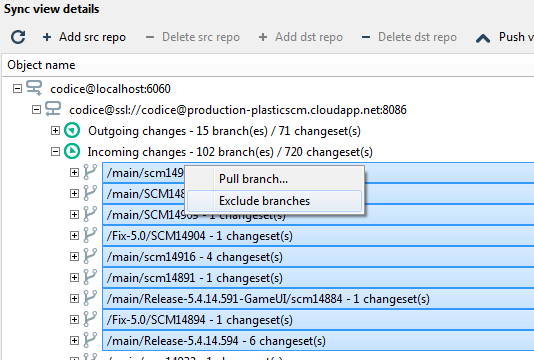 I just pull the branches I need (to develop, code review or manually test tasks before getting them released). It means there are a few thousand branches on the remote server that I’ll never pull. Some of them are already years old. 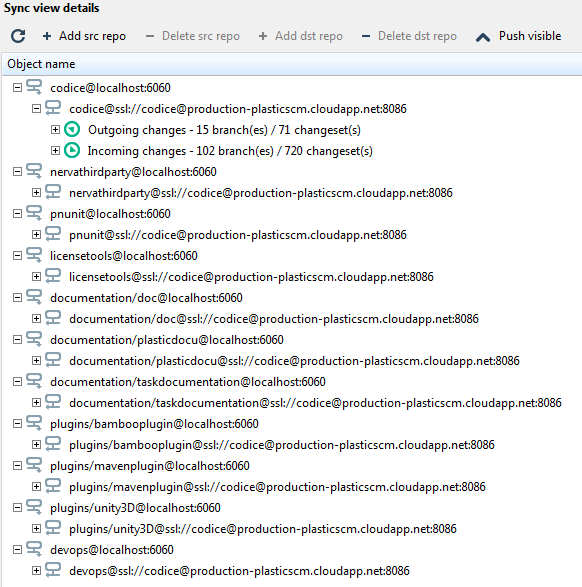 Since the SyncView calculates all the changesets that need to be pushed or pulled in order to let you preview them, it started to get slow with thousands of branches. That’s why we added the “excluded branches” feature. You can select the branches you won’t be syncing and just “exclude them”. The result is that the sync view will be much, much faster, saving precious time on each loop. We also added an option to show the “excluded branches” so that you can include them again in the calculation in case you need them later on (expanding the excluded branches is way much faster in 5.4 than in 5.0 since we implemented a new server API call in 5.4 to speed up the calculation, while 5.0 API is frozen and can’t take advantage of it). So from now on the “refresh” will trigger the calculation of the entire list of syncs instead of just the expanded ones, while you can still refresh them individually using the context menu. Especially when you’re using Xlinks it is very useful to use the filter to push (or pull) all the branches with a given name, in different repositories. We’ve added two new buttons: “push visible” and “pull visible” to launch the pull or push of all the branches selected by the filter. All the SyncView configuration is stored on a file named syncviews.conf. We’ve modified the file format to make it human readable and better structured than it was before. It will be automatically upgraded by the new 5.0 and 5.4 releases so no user action is required. 5.0.44.592 (August 6th 2014) and later. 5.4.14.593 (Aug 8th 2014) and later.